Add the vegetable butter and mix with an electric mixer at medium speed until fully incorporated. Reduce the speed and add the chicken stock until a dough forms. Divide the dough in 2 parts and place it on a baking sheet, spreading it with your fingers. Preheat oven to 350°F. In a big bowl, mix the carnitas with the canned veggies, onion, tomato, serrano chile, garlic and Mexican sauce. Season with salt to taste. Pour the carnitas preparation on the baking sheet. Put the rest of the dough over the carnitas, using your hands to spread it well and covering the whole filling. Bake for 30 minutes or until the dough starts to brown on the sides. Use homemade or store-bought carnitas. If you like Mexican tamales but never find the time to prepare them at home, you will love this recipe! 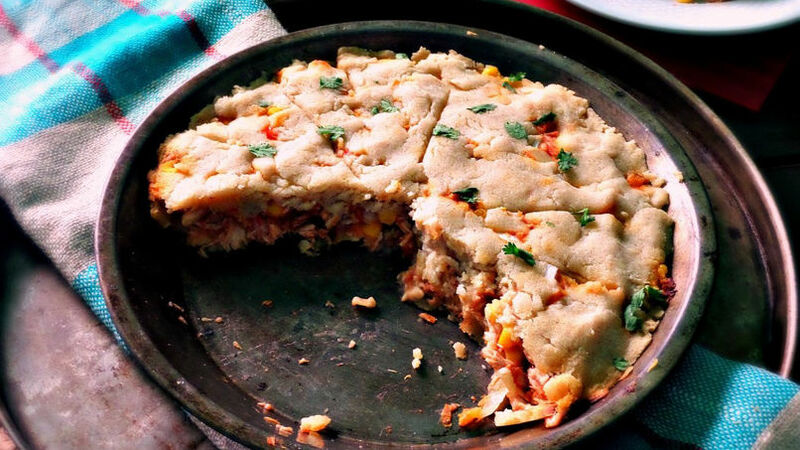 Made with a tamale dough filled with pork carnitas, veggies and a spicy Mexican sauce. Prepare this recipe in less than an hour and enjoy its amazing taste!